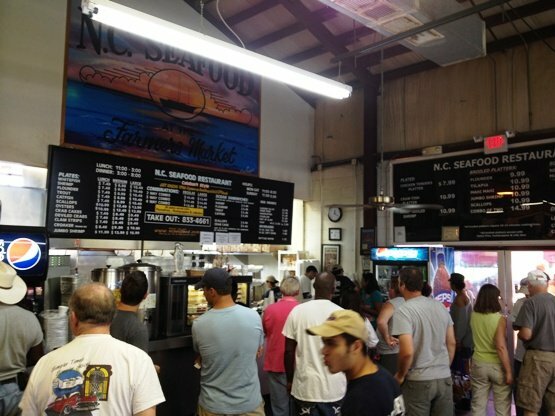 First Take: NC Seafood Restaurant at the State Farmer’s Market in Raleigh! 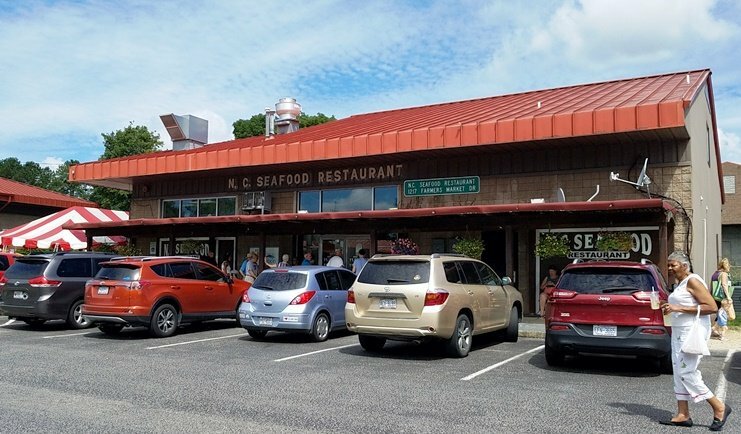 As a huge fan of the State Farmer’s Market in Raleigh, I’ve passed by the NC Seafood Restaurant many times. Located in the back row in a stand-alone building, you’ll immediately notice the red tents and picnic tables on the side of the building. And it had been a while since I had done some fried seafood so I took advantage of a day off to check out this Raleigh and Farmer’s Market classic! 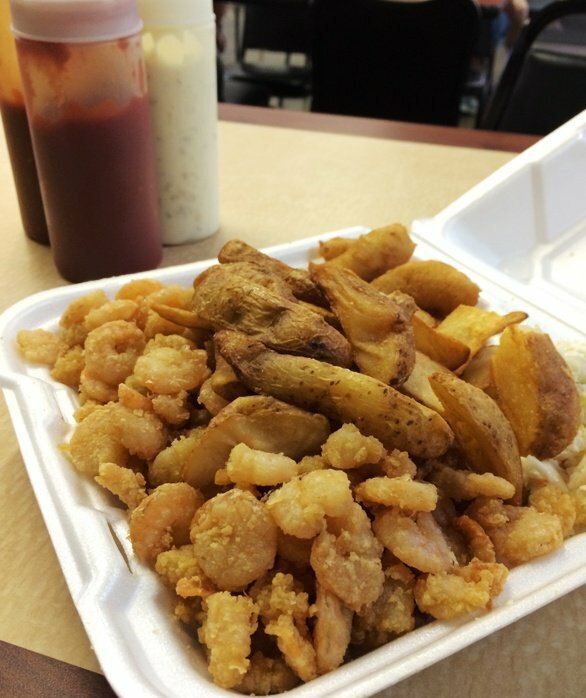 When you think fried seafood in North Carolina, you think Calabash. Growing up in New England they fry seafood differently up there but round these parts, it’ll be very lightly breaded and served with hushpuppies and slaw. 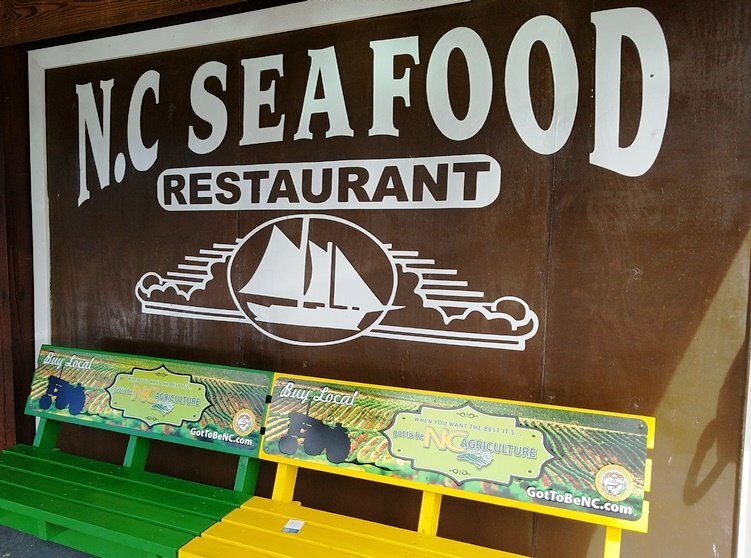 The NC Seafood Restaurant has the usual choices of fish (whiting, flounder, trout, shrimp, scallops, oyster and more) which you can get fried, broiled or in a sandwich. The interior of the restaurant is pretty bare and warehouse-like with a large black and white sign listing the menu. I order at the counter, going with the two way combo of shrimp and trout for $12. I get my receipt and number, grab a drink and chill out waiting for my order. Everything is nicely done in this huge plate off food. Hushpuppies are nicely fried and oniony and the potato wedges tender. Lightweight coating on the small shrimp along with nicely fried trout round out the meal. Don’t think the cole slaw is fresh-made but it worked fine to counter-balance all the fried. 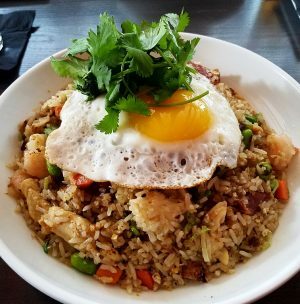 But the truth is that while the food here at the NC Seafood restaurant is all pretty solid, it’s more about quantity here than pure taste. Because while everything I ate was decent, nothing really stood out either. I think I ate my entire lunch, Arthur, which was NOT a good idea. Total food coma. Yep, they remind me off the seafood back home in Morehead City. 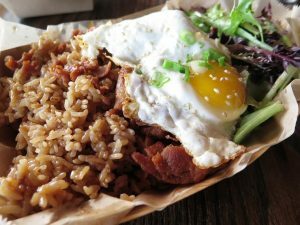 I usually can get several meals out of one order. The only drawback is you will smell like grease so your office mates will know where you had lunch! But it’s a good thing! I like this place for the occasional fried oyster sandwich. Usually I just go there when I am about to head home and work in the yard or take a shower or something because you leave there and you smell like fried food for the rest of the day otherwise! The prices aren’t ‘cheap’ but you get a lot for your $$. That’s funny, Randy! 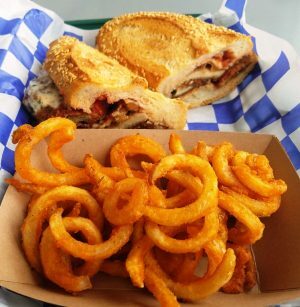 You plan your activities around your potential fried smell… I guess you could just do takeout too!